I have been wanting to make this cake since December. I had not made this recipe for years. I used to make it for family holiday dinners, but since it has eggs and cream I knew that I could not make it for my vegan son. Usually our entire holiday meals are vegan (and GF and soy-free) except for the meat. I used to make two different types of gravy and stuffing and desserts, etc., but then I just decided that enough was enough and make one of everything plus a vegan main dish. My whole family is happy and even my finicky sister looks forward to tasting the vegan main dish. To make a vegan version I could have easily replaced the whipped cream with coconut whipped cream, but making a cake that relies on whipped egg whites to get its’ proper texture was the part I could not figure out. Maybe tofu whipped?...but not now that my daughter-in-law is allergic to soy....help! Making the recipe GF was easy though. The texture of the cake is great, moist and springy like what I remember the original recipe was. No GF changes were necessary with the filling or glaze. The recipe was a Hershey’s one that I found in a magazine (1984). I really like Hershey cake recipes. They come out a deep dark chocolate if you use Hershey’s cocoa and I like their texture too. I actually used Trader Joe’s brand this time and this cocoa is not as dark and needs sifting before you use it (and is less expensive). The cakes taste just as good, but I prefer the darker chocolate look. Preheat the oven to 375 degrees. Prepare a 15-1/2 x 10-1/2 x 1-inch jelly roll pan by lining it with aluminum foil. Grease the foil well. Prepare a clean smooth dishtowel by dusting it well with confectioner’s sugar. You will need this right after the cake is done baking. Separate eggs. Whip the egg whites until foamy and gradually add 1/2 cup of sugar. Continue beating until stiff peaks form. Set aside. Beat the egg yolks and vanilla on high speed for 3 minutes using a stand mixer or an electric hand mixer. Add 1/3 cup of sugar and beat 2 more minutes. In a separate bowl combine the cocoa, flours, baking soda and powder, salt and xanthan gum. Mix together until well combined. Combine 1/3 of the flour mixture with the egg yolk mixture, alternating with 1/3 of the water. Continue combing the dry ingredients alternating with the wet ingredients until they are all mixed in. Just starting to fold the chocolate mixture into the whipped egg whites. Using a large rubber spatula fold the chocolate mixture into the whipped egg white mixture until there is a uniform light chocolate color and no large blobs of egg white are visible. What the batter looks like after the chocolate mixture is completely folded into the egg whites. Spread the batter evenly into the foil lined pan. 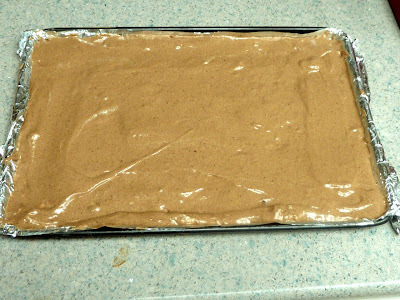 The batter spread out in the foil-lined jelly roll pan. Bake for 12-15 minutes until the top springs back when lightly touched. Hot cake inverted onto the dishcloth sprinkled with confectioner's sugar. Starting to peel off the foil while the cake is still hot. Immediately invert the cake onto the dishtowel dusted with confectioner’s sugar. 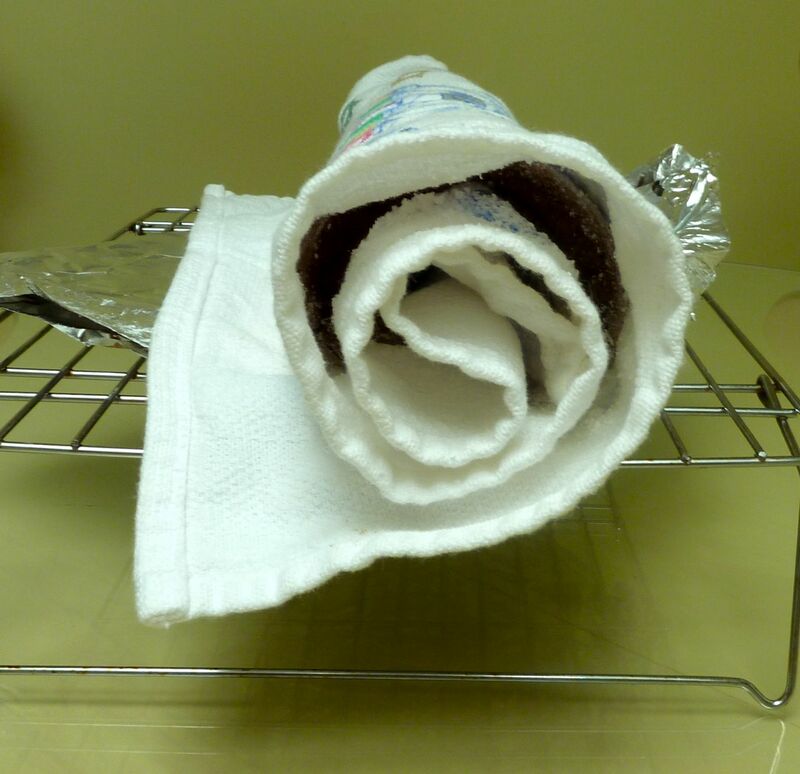 Starting at the narrow end, roll the cake up in the dishtowel and place the rolled cake still in the towel on a rack to cool completely. Be sure to keep the seam or open edge side down when the cake cools, so that the top will look nice and smooth and rounded. I line the rack with wax paper or foil to keep the cake from getting the lined impressions from the rack. You cool the cake in a rolled position so that the cake will keep its shape and not crack or break when unrolled and filled and re-rolled. Rolling up the hot cake in the dish towel. The hot cake cooling on a piece of foil on a rack. While the cake is cooling prepare the filling. Whip the cream until slightly thickened. Add the confectioner’s sugar to taste and also add the peppermint extract or crushed candy. Continue to beat until stiff. 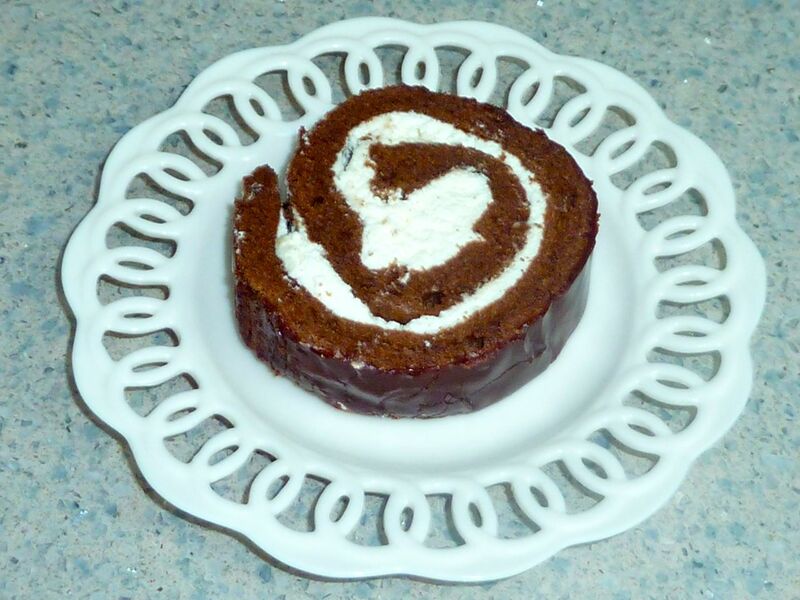 Cake with whipped cream filling spread evenly over it. When the cake is completely cooled unroll it. 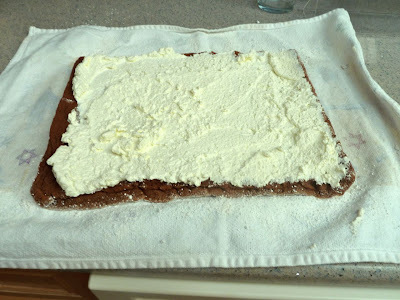 Spread all the whipped cream mixture over the cake and then reroll the cake. When this is done you can prepare the glaze. Cake rolled up. The edges are never even. You can trim each side if you like. 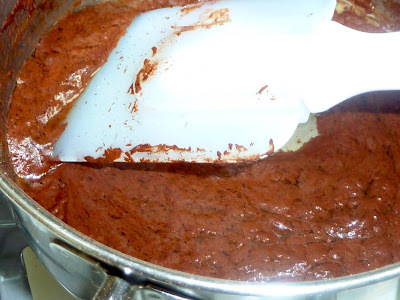 To make the glaze melt the butter in a sauce pan and add the water and cocoa. Stir this mixture constantly over a low heat until it thickens. Do not boil. Remove from the heat and cool slightly. If it cools completely it will make a thick spreadable frosting so only allow it to cool slightly so that the glaze will pour over the cake. Add the vanilla and the confectioner’s sugar and mix well. Chocolate glaze getting thick on the stove. Slightly cooled chocolate with confectioner's sugar added. I put the cake on a plate that I lined with two pieces of wax paper so that I could remove the paper when the glaze was set and have a clean looking plate. You can pour the glaze this way or place the cake on a rack over a baking sheet to catch the drippings and then use a spatula to transfer the cake to a plate. to catch the extra chocolate glaze. (One piece on each side so that I can pull them out easier. Pour the glaze over the cake. You can leave it as is with the dripping look or you can use a small spatula to spread the glaze evenly over the entire cake. Some people like to leave the ends unfrosted. Do whatever you prefer. Glazed cake roll with the wax paper removed. The glaze has not yet set. Keep the cake chilled until ready to serve and store leftovers in the refrigerator. You can wrap the entire cake and freeze it or you can slice the cake into pieces and wrap and store the pieces in the freezer to use at a later time. When ready to use, thaw in the refrigerator for several hours before eating. 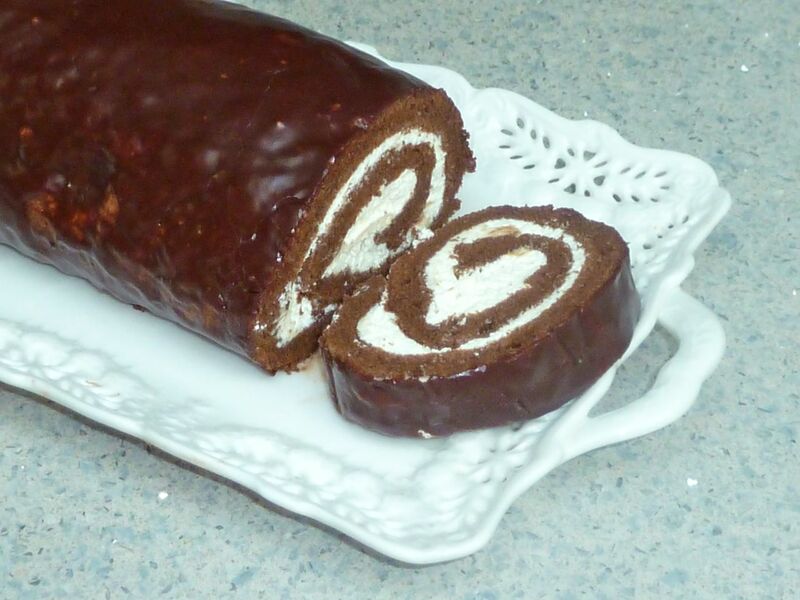 GLUTEN FREE CHOCOLATE MINT CAKE ROLL Ingredients CAKE 4 Eggs 1/2 cup Sugar 1 tsp. 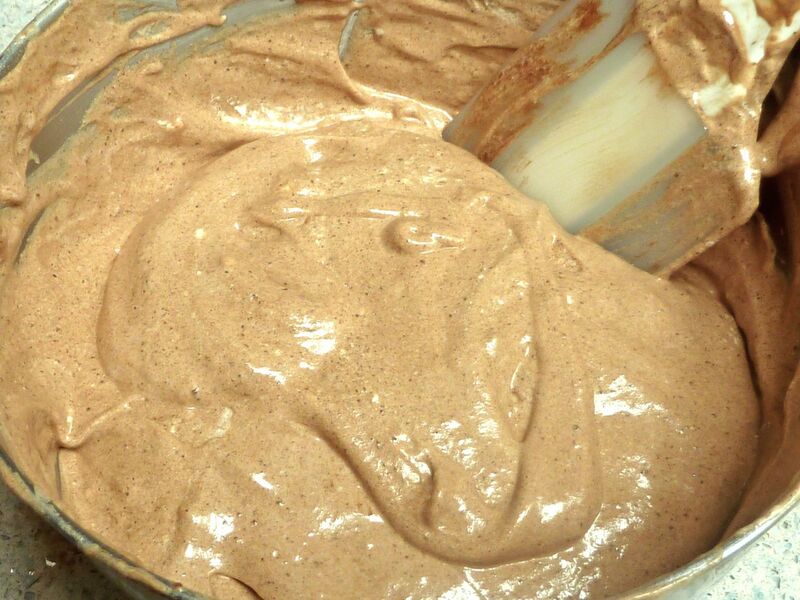 Vanilla Extract 1/3 cup Sugar 1/3 cup Cocoa Powder (unsweetened) 1/4 cup Sorghum Flour 3 Tbs. Tapioca Flour 1 Tbs. Chickpea Flour 1/2 tsp. Xanthan Gum 1/2 tsp. Baking Powder 1/4 tsp. Baking Soda 1/8 tsp. Sea Salt 1/3 cup Water FILLING 1 cup Heavy Whipping Cream 1/4 cup Confectioner’s Sugar (I used 2 Tbs. as half the amount of sugar was perfect for my taste. You can adjust the sweetness to your taste.) 1/2 tsp. 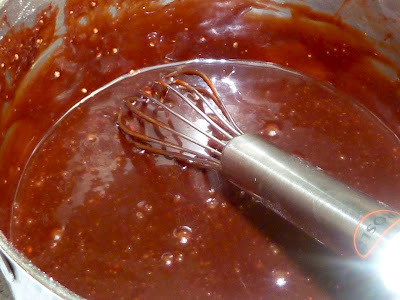 Mint Extract (or 1/4 cup finely crushed peppermint candy) Few Drops Red Food Coloring (optional) CHOCOLATE GLAZE 2 Tbs. Butter (unsalted) 2 Tbs. Cocoa 2 Tbs. Water 1 cup Confectioner’s Sugar (I used 3/4 cup) 1/2 tsp. Vanilla Extract DIRECTIONS CAKE Preheat the oven to 375 degrees. 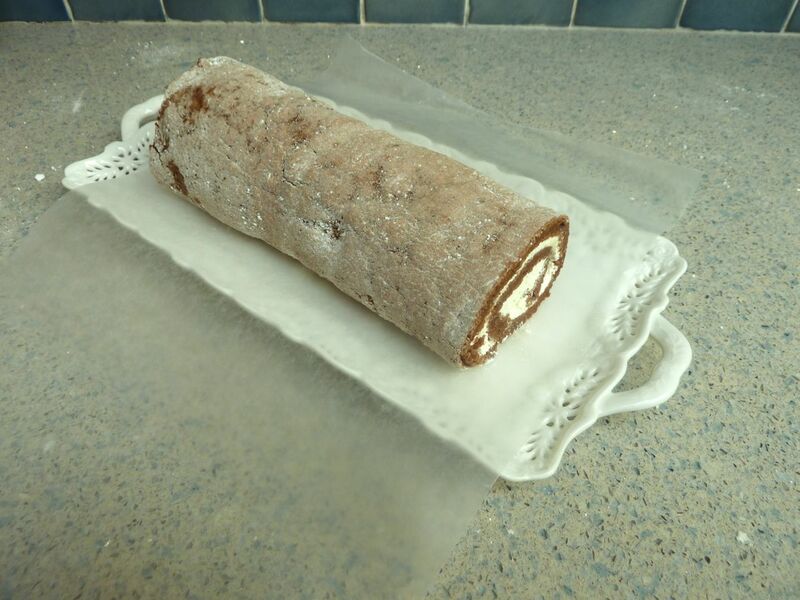 Prepare a 15-1/2 x 10-1/2 x 1-inch jelly roll pan by lining it with aluminum foil. Grease the foil well. Prepare a clean smooth dishtowel by dusting it well with confectioner’s sugar. You will need this right after the cake is done baking. Separate eggs. Whip the egg whites until foamy and gradually add 1/2 cup of sugar. Continue beating until stiff peaks form. Set aside. Beat the egg yolks and vanilla on high speed for 3 minutes using a stand mixer or an electric hand mixer. Add 1/3 cup of sugar and beat 2 more minutes. 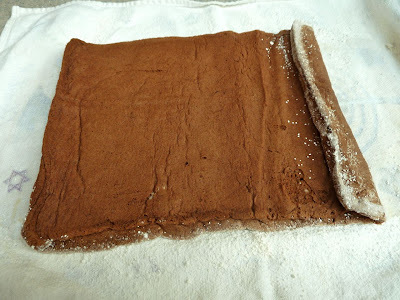 In a separate bowl combine the cocoa, flours, baking soda and powder, salt and xanthan gum. Mix together until well combined. Combine 1/3 of the flour mixture with the egg yolk mixture, alternating with 1/3 of the water. Continue combing the dry ingredients alternating with the wet ingredients until they are all mixed in. 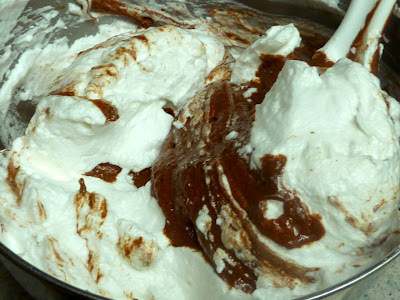 Using a large rubber spatula fold the chocolate mixture into the whipped egg white mixture until there is a uniform light chocolate color and no large blobs of egg white are visible. Spread the batter evenly into the foil lined pan. Bake for 12-15 minutes until the top springs back when lightly touched. 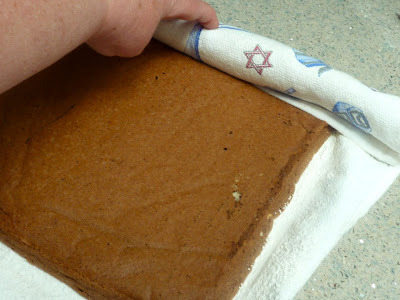 Immediately invert the cake onto the dishtowel dusted with confectioner’s sugar. 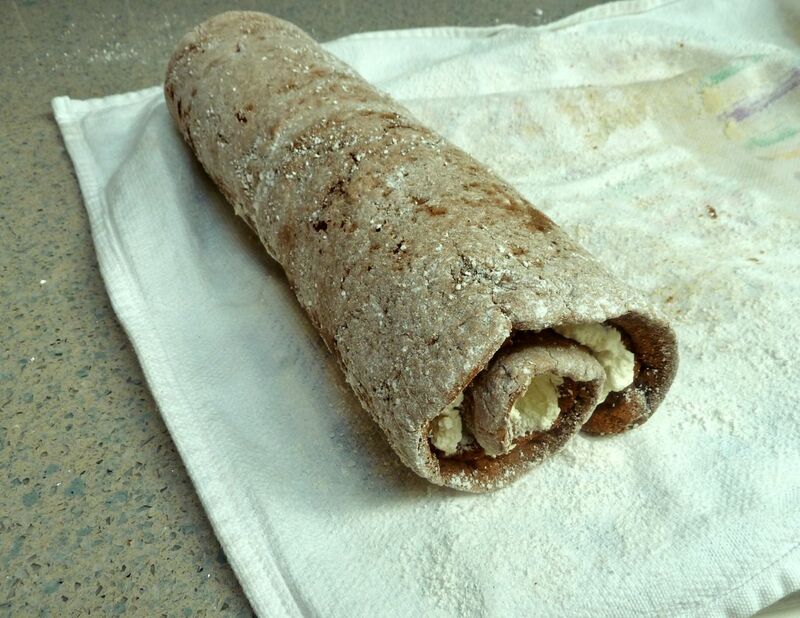 Starting at the narrow end, roll the cake up in the dishtowel and place the rolled cake still in the towel on a rack to cool completely. Be sure to keep the seam or open edge side down when the cake cools, so that the top will look nice and smooth and rounded. 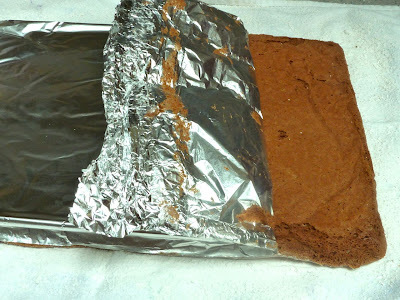 I line the rack with wax paper or foil to keep the cake from getting the lined impressions from the rack. You cool the cake in a rolled position so that the cake will keep its shape and not crack or break when unrolled and filled and re-rolled. While the cake is cooling prepare the filling. Whip the cream until slightly thickened. Add the confectioner’s sugar to taste and also add the peppermint extract or crushed candy. Continue to beat until stiff. When the cake is completely cooled unroll it. Spread all the whipped cream mixture over the cake and then reroll the cake. When this is done you can prepare the glaze. To make the glaze melt the butter in a sauce pan and add the water and cocoa. Stir this mixture constantly over a low heat until it thickens. Do not boil. Remove from the heat and cool slightly. If it cools completely it will make a thick spreadable frosting so only allow it to cool slightly so that the glaze will pour over the cake. Add the vanilla and the confectioner’s sugar and mix well. I put the cake on a plate that I lined with two pieces of wax paper so that I could remove the paper when the glaze was set and have a clean looking plate. You can pour the glaze this way or place the cake on a rack over a baking sheet to catch the drippings and then use a spatula to transfer the cake to a plate. Pour the glaze over the cake. You can leave it as is with the dripping look or you can use a small spatula to spread the glaze evenly over the entire cake. Some people like to leave the ends unfrosted. Do whatever you prefer. Keep the cake chilled until ready to serve and store leftovers in the refrigerator. You can wrap the entire cake and freeze it or you can slice the cake into pieces and wrap and store the pieces in the freezer to use at a later time. When ready to use, thaw in the refrigerator for several hours before eating.